Our follow-up article on What Bank On Yourself Is NOT gives you proof that the Bank On Yourself concept is not a scam. We take on the negative reviews about Bank On Yourself and reveal why some people intentionally misrepresent Bank On Yourself. We stress that the Bank On Yourself concept is not an investment (and reveal the 5 reasons why it’s actually better). We explain why Bank On Yourself is not “just” whole life insurance, and what separates Bank On Yourself from similar-sounding-but-different strategies. And we tell you bluntly who Bank On Yourself is not right for. It’s our hope that these two articles will help you understand how the Bank On Yourself strategy could bring you the financial security and peace of mind that are missing from traditional retirement planning and investing strategies … and give you a better understanding of the concept and the real meaning of Bank On Yourself. To learn more about Bank On Yourself, either before or after reading What Is Bank On Yourself? 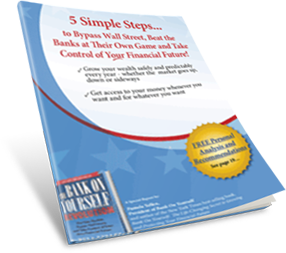 and What Bank On Yourself Is NOT, get our Free Special Report, 5 Simple Steps to Bypass Wall Street, Beat the Banks at Their Own Game, and Take Control of Your Financial Future. And to discover specifically what adding Bank On Yourself to your financial plan could do for you and your family, request a FREE Analysis of your situation. When you request your FREE Analysis here, you’ll receive a referral to an Authorized Advisor (a life insurance agent with advanced training on this concept) who will prepare your Analysis at no cost and with no obligation.